K, for reasons beyond me, is my favorite letter. Perhaps because it's one of those sharp letters that never gets used, like X and Z. I can't say for certain though. At any rate I just decided to have chickens poking from various angles out of it. Also the different lines having separate outlines was entirely by choice. I think it looks smoother like that than it did then I tried it without. Also thank you to Nolan for commenting on me. I am indeed a fan of yours and voted for your site before you said anything. 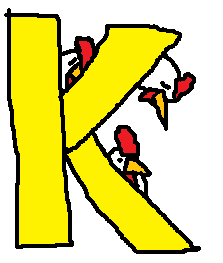 K is my favorite letter too!